Written for busy new managers. 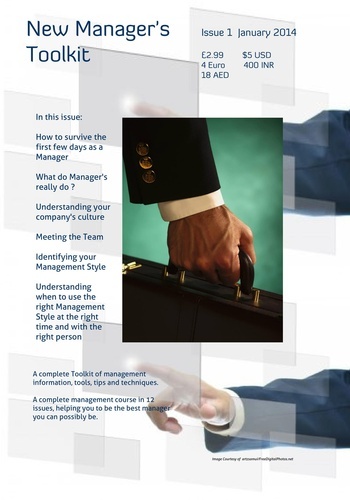 If you have just started a new job as a manager this toolkit of concise information, tips, action plans and checklists will help you to avoid costly mistakes and be the very best manager you can be. How to communicate assertively and say what you mean, mean what you say. How to carry out a thorough Staff Appraisal for each member of your team. How to make professional presentations. How to set meaningful and achievable goals for you and your team. How to make sure the team focuses on providing excellent customer service. How to manage your projects. How to hire the right people who will do the job properly.